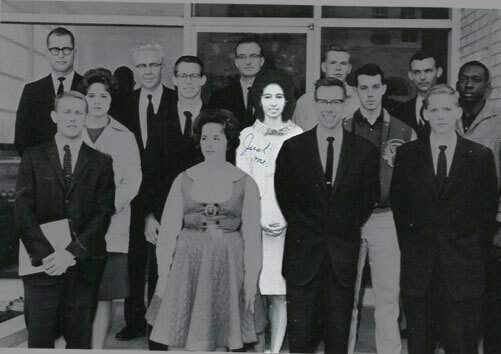 Minerva De La Garza (center, highlighted), stands with some of her classmates as an undergraduate. This photo was taken from De La Garza’s personal St. Mary’s yearbook. Minerva De La Garza (B.S. ’67) ranks among the first female undergraduate students to earn her degree from St. Mary’s University. She spurned stereotypes by following her love of chemistry into a long career in scientific research and a life of service. The St. Mary’s campus she remembers from 50 years ago was much different than from today; there wasn’t yet a residence hall for women (Dougherty Hall would open in 1968), and the only women’s restroom was in the basement of St. Louis Hall. And since De La Garza didn’t own a car, she rode the bus every day to and from St. Mary’s. It was there that De La Garza and her sister were initially home-schooled by their mother, who taught them how to write in cursive and read using whatever was available, including newspapers and canned food labels. Eventually, De La Garza became valedictorian of her 503-student class at Fox Tech High School. Despite the honor, she was dissuaded from going to St. Mary’s by the dean of women at her high school. She was told, instead, to focus on becoming a secretary. “I’ll never forget she told me that if I went to college, I would fail,” De La Garza said. 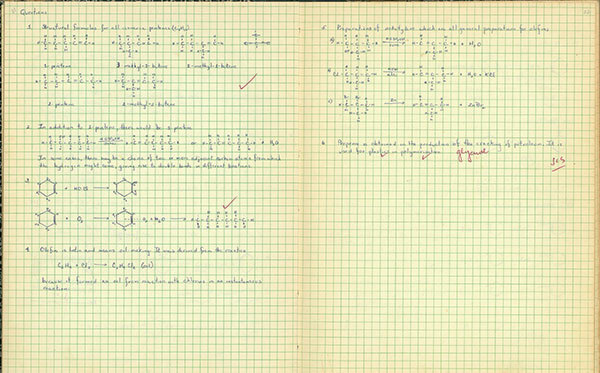 De La Garza’s notes from chemistry class were checked frequently by her professor for grades. Rather than take the comment to heart — De La Garza said such remarks to women at the time were commonplace — she pursued what was in her heart. As a Chemistry major and Mathematics minor, De La Garza often found herself as the only woman in her classes. In addition, she admitted to having trouble keeping up with coursework at first. “There weren’t many educational resources in the schools I went to growing up, so I felt behind the other students when I got to college,” De La Garza said. She recalled especially struggling in trigonometry. However, her mentality to “move forward” enabled her to persist. In the summer going into her senior year, De La Garza applied for a civil service job as a clerk typist. In the comments section of the application, she included science classes she’d taken at St. Mary’s and the grades she’d earned. She didn’t know that by doing so, a life-changing door would open. De La Garza was accepted as an intern at the United States Air Force School of Aerospace Medicine, at the now-closed Brooks Air Force Base, but not as a typist. They wanted her in the labs, researching how to enhance rocket fuel for astronauts. After De La Garza graduated, the School of Aerospace Medicine, impressed with her work the previous summer, hired her full time. She worked there for several years conducting experiments for NASA in its early days. of a newly constructed medical school in town — what’s today UT Health San Antonio. 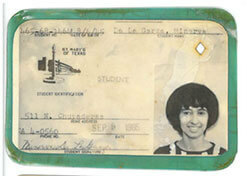 De La Garza’s student ID card. She was signed on as a research assistant for the then-new division in breast cancer studies, for which she collaborated with a five-person team of dedicated scientists. Much of De La Garza’s work involved examining tumor tissue in rats. “We would get tumor specimens from all over the country, and I would log them all into our system,” De La Garza said. De La Garza explained how taking chemistry classes with the late Brother Charles Cummiskey, S.M., helped her in her career. At the health science center, De La Garza said she felt she’d found her place. She poured years into breast cancer research, and often worked seven days a week. Eventually, her duties expanded, and she became an administrator helping to oversee grant funding for her division. After 35 years of service, she retired in 2005. Today, she spends much of her time caring for her chronically ill sister. Despite the physical and mental rigors of caretaking, De La Garza believes she’s simply applying the values her parents instilled in her, the same values she applied at St. Mary’s and in the labs. “My whole personality is that of service,” she said.